Quiz - users must answer a question correctly before they can move on in the lesson, so only the number of attempts is recorded. Test - users can give incorrect answers, so the answer selected is recorded. 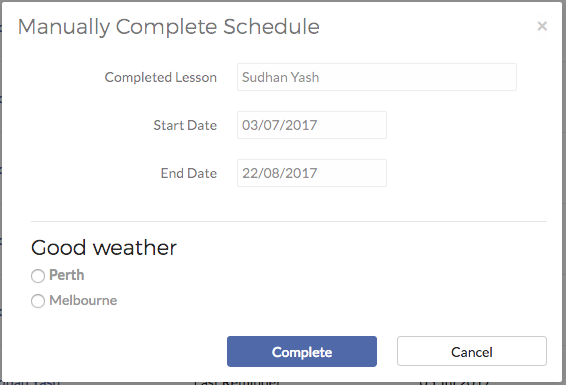 Once question information has been added, click [Complete] to save results and complete the schedule. IMPORTANT: Results cannot be updated once submitted, so please review carefully. Manually completed users are recorded as complete for report purposes. However, under Lesson Results, the status is shown as “Manual” rather than “Completed” and a tool-tip will detail who was responsible for the manual completion.